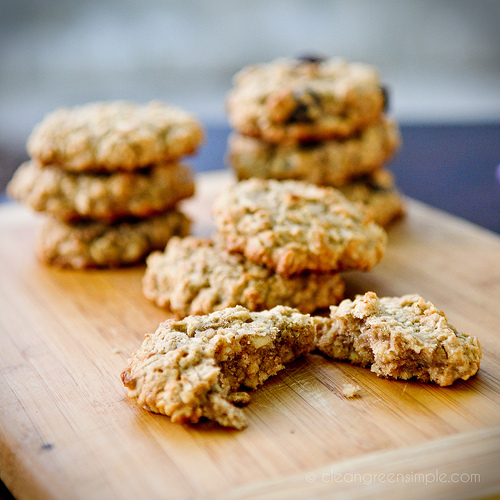 Simple organic oatmeal cookies — vegan, gluten free, refined sugar free, and totally delicious. It’s so fun learning about all of the ways I can make things healthier without sacrificing taste or texture or, well, anything. 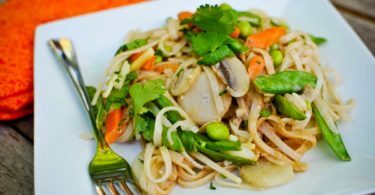 Those of us who don’t eat animal products, gluten, sugar, or have various other dietary restrictions are well aware that sometimes you have to jump through a few hoops to get a similar experience to a recipe you remember. But there’s also many times when you can just re-think something a little and it’s not any harder than before! These cookies are a fabulous example of how you can make some simple changes to a recipe, making it much healthier, while keeping the effort and number of ingredients similar to the original. OK, OK, when I just listed it all out like that my new ingredient list sounded kind of….unimpressive. But trust me when I say these cookies come out fabulous – moist and chewy with just a bit of crispiness on the bottom and edges. And they do in fact taste delicious! They also have the benefit of being really easy and only needing one bowl. Just combine all your ingredients and mix them really well (I used a hand mixer to make sure everything smoothed out nicely) – you’ll end up with a dough that’s slightly wetter than normal cookie dough, but can still be shaped into balls. At this point you can add raisins or nuts or whatever you’d like – I added raisins to half of mine and loved them both ways. Once you’ve got your dough you can feel free to stop here and eat it with a spoon – I won’t judge. But if you absolutely must, you can portion it onto a cookie sheet and bake for about 10 minutes or so until they’re nice and golden brown. Let them cool on the cookie sheet for a couple of minutes and enjoy! So, lovely readers, what’s your favorite type of cookie? A simple organic oatmeal cookie recipe that's vegan, gluten free, refined sugar free, and totally delicious. Mix all ingredients in a medium bowl - make sure to blend it well enough that there's no chunks of banana. Place rounded spoonfuls of dough onto a cookie sheet and bake for about 7-10 minutes, until light golden brown. Remove from oven and let the cookies finish baking on the cookie sheet for about 5 more minutes. Enjoy! Yum! I love oatmeal cookies! Especially really “oatey” ones with raisins! If you figure out a good mix let me know! I’m so glad I found your blog! These cookies sound delicious and I can’t wait to browse other recipes in your blog too! Well I think I know what type of sweet treat I’ll be making this weekend! These look amazing. I think I’ll use coconut oil in mine! Thanks for such a delish, healthy verion of my all-time favourite cookie recipe. Ooh, coconut oil would be great I bet! I mst say though, my favourite cookies are soft, chewy chocolate chip. I found a recipe online and substituted butter with canola oil, chocolate chips with carab and the eggs and used rye flour and they turned out INCREDIBLE. My boyfriend, loved them as much as he loves normal cookies, which is saying something! I agree these look so delicious. You always have the best recipes!! 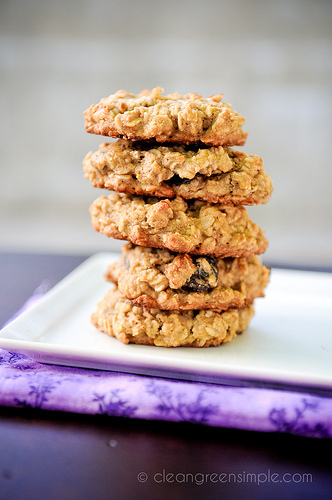 I made the silly mistake of whipping up a batch of oatmeal raisin cookies a couple of nights ago without a recipe. Generally that’s fine, but I forgot the baking soda! The cookies turned out pretty good… they just have no puffness to them that you would expect from a cookie 🙁 I’ll have to follow this recipe next time! My fave cookie is oatmeal,But i found a recipe for organic coconut chocolate chip cookies…and they are delicious! Who doesn’t like bananas? Mmm these cookies sound deeeelightful! Also wanted to let you know that I used wholewheat flour since the GF flour that you use isn’t available here, and it worked perfectly well! You are awesome! These cookies are super good. I added a whole banana and halfed brown rice flower with all purpose baking flower (because i dont like the taste of it) and the recipe turned out great! It was kinda like banana bread and oatmeal cookies. They were a little more moister (like banana bread) than the pictures you have here. Next time i will add walnuts. I am very pleased that this recipe does not taste gluten, dairy, egg free. I is just pure yummy. This recipe looks great! 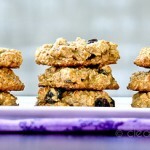 I’ve been looking for a oatmeal cookie that is chewy and stuffed with health for my toddler—portable snack! I”m going to try these this week! Thanks again. These are the best!! Thanks for the recipe! I realize the maple syrup is a substitution for granulated sugar, but does it matter what type of maple syrup you use? Oh my goodness! I LOVE these cookies! I have made a batch of them almost every other night this week! I cut the maple syrup in half to reduce the sugar, and they still tasted amazing! Thanks for the recipe! Just made these with coconut oil, and I used an egg instead of the banana, plus dark chocolate chips, and they are the best cookies I have ever made. SOOO good. Wow! These look delicious, and taste fantastic! I added epicure gingerbread spice instead of cinnamon and added a tsp. of natural peanut butter, which made it extra chewy and a little creamy! Mmmmm! I Love these cookies and now have made several variations. 1/2 as much maple syrup is great! Coconut oil is great! 1/4 cup apple sause instead of banana is great! Vegan dark chocolate chips are great! Finally all of these things plus peanut butter Awesome! These came out awesome! I didn’t use oil (only Smart Balance Light with Flax), I didn’t have flaxseed, vanilla or raisins and they still came out awesome. I dipped one in my almond milk tonight for that Cookies & Milk feel and I’ll have one tomorrow with my morning coffee. Completely took care of my sweet tooth. Yum! I made a second batch adding the vanilla extract and I used organic oat flour and added organic dark chocolate chips and walnuts and they came out so delicious! Yum, thanks! My daughter who can eat anything wanted a play date treat, but my son and I are gluten free and vegan. I used a mix of sorghum and GF oat flours and tapioca starch, equal parts of each (so the ratio was 2 parts flour to 1 part starch). Everyone was happy! Jessica, these were amazing!!! Made a big batch for a whole crew of kiddios ages 3-7 and they loved them.!!! I loved them because they were vegan, dairy and nut free, and since I used almond flour they were wheat free! I had a couple of kiddios here with allegries, it was great to serve them a treat they could all enjoy! Thank you for this awesome reciepe. I plan on sharing it with many of my friends. I just took these oatmeal cookies out of the oven. Oh, my gosh! Fabuolus! I used a combo of Brown Rice Syrup and Maple Syrup and added pecans with a scrape of coconut oil on the cookie sheet. They are chewy and crispy. So delicious! Thanks for the receipe. It will be a standard at our house. These are amazing! Our new family favorite! I make them with gluten free spelt flower since several family members are gluten intolorant. This recipe is a keeper! Is it possible to substitute the oil with ground flax seed? Thanks for the recipe! Could I substitute honey for the syrup? Delicious!! Thanks so much! Made some this evening, no raisins, no chocolate chips (only because I didn’t have any), I used honey instead of maple syrup, and coconut oil. Awesome. I am new to clean eating and have been craving cookies, these hit the spot! Thanks! Do you store them in the fridge? yay! this is a great recipe! used baked sweet potato instead of bananas, and brown rice syrup instead of maple and it worked wonderfully! so yummy on a frigid snowy day. your recipe was not nut free! 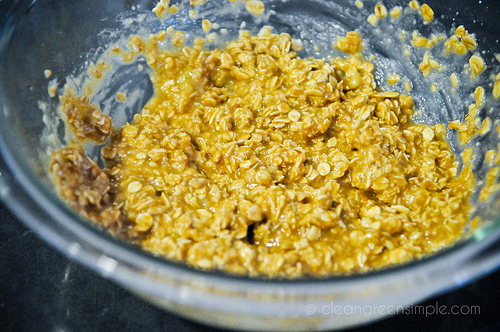 My husband found this recipe last night when I asked him to look on pinterest for a vegan Oatmeal Raisin recipe. After putting the first batch in the oven, I looked at the recipe again and had forgotten to add the flour. First batch came out of the oven and were great. I didn’t add the flour to the rest of the batter and they were great. A big hit with the hubby and little ones also. Will be making again for my little ones Xmas party. I also sub unsweetened applesauce for oil. I just made these! They were amazing! Made these yesterday. Really, really good. I used coconut oil, dried cranberries and Enjoy Life mini chocolate chips. Great recipe, thanks for posting. 42 Calories a cookie! 🙂 I made it into about 38 mini cookies. If you make them bigger they would probably be more. I should mention that I only used 1 TBS of Coconut oil (that’s all I had for oil) and then I used a splash of coconut milk and then added in 3/4ths a can of Pumpkin + more cinnamon and some ground cloves. Then I tossed in some mini enjoy life coco chips. Thank you. I legit just ate an entire batch in one sitting. My Son is Vegan and I’ve made these several times! He LOVES them! I’ve added nuts and coconut to them. He prefers them in bar form so I cook them for about 15 min. I don’t understand.. when are asked to rate these cookies why are most of the comments , ” Those look great, I have to make them”. Actually make the cookies and then leave a comment on how they tasted so other’s will have an idea whether or not to make them!!!!!!! 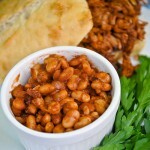 This recipe looks great and I plan to make it soon. Please check out the toxicity of canola oil. Ever since I found this recipe last month, I’ve made them almost every week! They are sooo good! I’m newly gluten/dairy plus more free and am so glad I found these! I love them! You’re welcome, Lauren! Glad you’re enjoying the recipe.